12th April 2019 peacefully at Altnagelvin Hospital, beloved wife of the late Tom (formerly of Farlow Road, Waterside, loving mother of Roger, dear mother-in-law of Claire, sister of Sylvia and the late Joan and a much loved aunt and great aunt. Funeral service in W J O'Brien & Son's Funeral Home, 110 Clooney Road, Eglinton on Monday at 2.30 pm. Interment afterwards in Ballyoan Cemetery. Family and friends are welcome to pay their respects at the funeral home on Sunday evening between 7 pm and 9 pm. Family flowers only please. 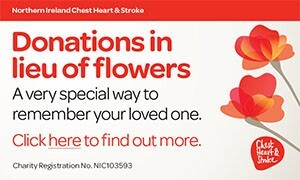 Donations in lieu of flowers if wished to Christ Church, 1 Infirmary Road, Londonderry or the Comfort Fund, Longfield Care Home, 2 Longfield Road, Eglinton, BT47 3PY. The Lord is my Shepherd. Family flowers only please. Donations in lieu of flowers if wished to the Comfort Fund, Longfield Care Home, 2 Longfield Road, Eglinton, BT47 3PY. I am sorry to tell you that Olga BAILEY has passed away.